Whoa. I'm finally home blogging at my kitchen table for the first time in almost two months. The last two months - Costa Rica for my yoga teacher training, then California for the holidays - have been a whirlwind of transformation, fun, laughter and tears, new friends, yoga, sunshine, family time, and more. I ended it with a workshop this past weekend on Grounding Yourself for the New Year, including a grounding yoga practice and a nutrition talk on grounding foods to build a strong immune system. It felt like the perfect class for me to lead - and take - as a reminder for me going into 2016 to reground myself after so much travel. Now, that I'm home, I'm truly feeling happy to not have any plans to leave for a while. Being winter, it also luckily means, I can slow down and cozy up in my flannel and fluffy socks. While I do have big plans for this year and am ready to go for it, I'm also aware that what I need most this coming week is to REST and slow down. One of the biggest lessons from my yoga teacher training was the importance of savasana. If you've ever taken a yoga class, savasana (corpse pose) is the ending relaxation pose where you allow yourself to melt into the ground and rest before moving onto the rest of your day. One of the biggest benefits is integrating everything that happened in class into your body instead of rushing onto the next thing on your to-do list. It gives your mind and body a chance to process, as well as letting any emotions that came up in class to be present, settle, or release. When I first started yoga, I didn't think savasana was very important. I laid there with thoughts running through my head, wondering when I could get up again. Yet, over time, it's been one of the most important parts of my practice. I can feel a huge difference in how I feel - physically and emotionally - when my savasana is absent or short. I want to take this idea of savasana off the mat into my life. I just spent the past two months traveling, learning, diving deep, and expanding. It took a lot of physical energy to practice daily - often multiple times a day - and emotional energy to bring awareness to what patterns or beliefs are holding me back. Now, I need to savasana - process and integrate it all to bring the lessons I've learned into my daily existence. I have this opportunity to build new daily routines and make space for what's really important in my life. This means returning to my essential self-care routines - that have been sorta lacking in the last few weeks after training - and creating new ones to support me. If I want to blog, coach clients, teach yoga, run workshops or groups, travel, snowboard, yoga, and more this year, I need to build a strong foundation first. I can't do any of that - not well at least - if I'm not taking care of myself first. If there's anything I've learned these last few years, it's that I have to take care of myself in order to show up as my best in the world. I have to honor my physical body with movement, nourishing foods, and sleep. I have to be present with my emotional body - giving myself permission to feel whatever is present, not judging my emotions, and bringing awareness to what I need. I have to be aware of my heart - listening to my intuition, speaking my truth, connecting to it daily. So, what am I planning to work on this week? Journaling! I journaled nearly everyday in a hammock in Costa Rica and always find it therapeutic to just write. Yoga. I'm ready to get back on my mat more consistently, to feel free in my body, and back to both vinyasa and yin style classes. Cooking! This is a big one. The past two months, I've had nearly all my meals cooked for me. I am so ready to try new recipes and just get back in the kitchen to mindfully cook. Sleep, relax, rest. Finally, I'm giving myself permission to be lazy in my cozy clothes on the couch with Netflix on. Or read with a book and a cup of tea in bed. To sleep in. To relax and rest. Journal about resting. How do you need to make more space for relaxation and rest? Do you need to set yourself a bedtime? Or schedule in 'white space' into your calendar? Do it, and follow through. You deserve it. Take a break each day. Set aside at least 20 minutes (ideally more - like an hour or so) to rest. Set an alarm, and lie down for a power nap or savasana. Watch Netflix. Read. Color. Just be with yourself, and rest. Take a yin or restorative yoga class. I sometimes joke that yin yoga is yoga nap time. Yet, it can be quite a challenging practice for many because you're holding passive poses for 3-5+ minutes. Give yourself this gift to be present with yourself - you may learn a lot. Trust yourself! Trust that you can take a break, and notice the effects after you rest. Build this practice into my daily life, and I'm sure you'll feel more balanced, calm, restored, and perhaps even more productive with your work. I know it can be hard to take a break when you are busy, but it is often one of the best things you can do with your time. 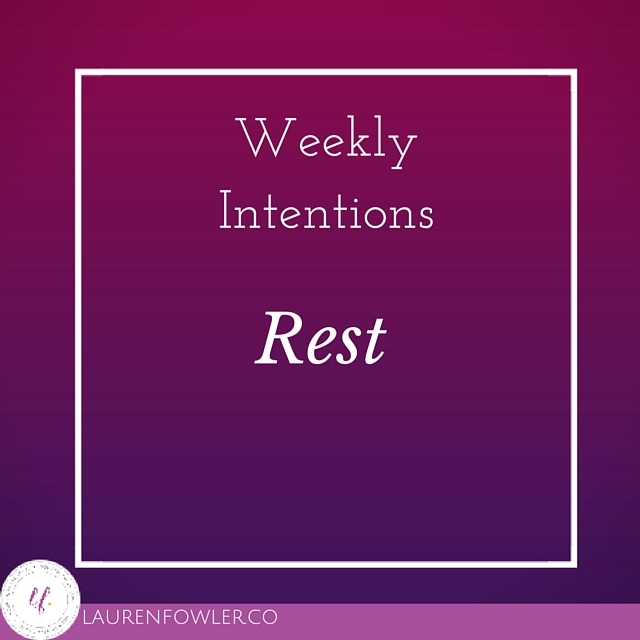 How are you going to use the intention of REST in your life this week?